"Simpson Travel is an outstanding company with great organisation, efficiency, accommodation and support...we could not have asked for more with our holiday at U Casale. Exceptional!" "I was a little nervous travelling alone with my daughter and son for the first time, but I couldn’t have wished for a better experience…"
"Villa Mare was an excellent choice for our three-generation holiday. Lovely villa and surroundings and everything ran smoothly. Thank you Simpson Travel and Jenny, the local representative…"
"We had an excellent week in Villa Monte Ortu near Calvi! The villa and pool are well appointed, it’s spacious and has the most incredible views. We loved Calvi and Ile Rousse and all the various beaches in-between. " "We had a lovely week in beautiful Casa Santa Maria… The villages in the countryside are a must – not only are they spectacular, but they have the most superb views…"
Towering above a glittering Mediterranean, Calvi's citadel has been fending off would-be conquerors for centuries. It stands as an iconic image of the island; a bastion of honey-coloured stone, impenetrable and defiant, set against a juniper and rose-speckled wilderness with snow-white mountains beyond. Below the citadel’s walls, a charming town bobs along to a lively cultural scene that rightly draws luxury yachts to its quirky boutiques, buzzing pavement cafés and pretty palm-edged harbour. Beyond it all, a three-mile arc of perfect sand wraps round an idyllic bay. Of the invaders who did manage to raise their flag over Corsica, it was the French who went the distance – their influence perhaps no more evident than in the neighbouring town of L’Île Rousse. Named after the red rock on which it sits, this unique settlement is more modern in design and greets the visitor, unexpectedly, with echoes of grander conurbations along the French Riviera. Traditions, though, are as alive here as they are anywhere on the island; with locals playing pétanque in a town square shaded by century-old date palms. In the magnificent countryside of The Balagne, the Garden of Corsica, tiny Medieval villages cling to imposing mountainsides, safely out of reach and hidden among the natural drama of a breathtaking landscape. These are the villages postcards were made for, full of rustic charm against a backdrop of rolling golden hills. Today, their walls protect a renaissance of interest in traditional crafts and cuisine and it’s through these ‘fortified villages’ that La Route des Artisans leads the culture seeker to meet the artists, potters and weavers who ply their trade here. Below granitic drama and hills rich in fig, citrus and olive groves hides a coastline as unspoilt as any the Mediterranean has to offer. Particularly in the Calvi region, where maquis-rich nature reserves sweep down to unique pink-tinted rock formations and fashionable marinas fill with super yachts as the sun sinks towards the sea. Whether you drive, cycle or hike, you’ll find unparalleled views around every twist and turn, while those in search of relaxation will find heavenly beaches – their whiteness a brilliant contrast to the aquamarine waters as far as the eye can see. A mere stone’s throw from Sardinia, Corsica’s typical dishes suggest a more Italian influence than a French one, although the flavours of Nice and Provence often shine through. The island is famed for its charcuterie, considered by many to be the best in the world. Look out for a smoked ham called prisutu and chunky salamis flavoured with herbs and served with brocciu, a ricotta-like cheese made with goat’s or ewe’s milk. Wild boar and lamb are the predominant meat specialities, traditionally served slow-cooked or stewed. For a lighter alternative, try fresh river trout or sumptuous huîtres (oysters), plucked from the waters of the east coast. Desserts are often cream or cheese based or may be made with another of the island’s specialities, the famous farine de châtaigne chestnut flour. 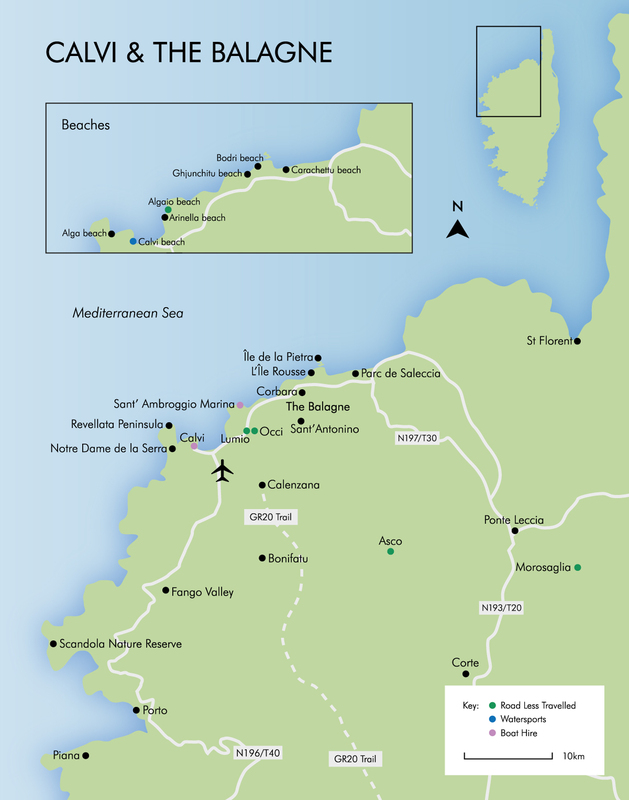 For such a small island, there’s a surprising variation in wine styles across Corsica. Niellucciu, Sciaccarellu and Vermentinu grapes are all grown here, and sweet and syrupy Muscat is the apéritif of choice. For those in search of a beer, the island’s very own Pietra (made from chestnuts) is served almost everywhere. Calvi boasts some remarkable restaurants, one or two providing front row seats to a picturesque harbour. Diners in L’Île Rousse are spoilt for choice too, with the cobbled streets of the Old Town offering both local specialities and Mediterranean classics. For romance seekers, the restaurants on the beach are the place to head. Away from the coast, there’s sophisticated dining to be had in the villages of La Balagne, including Lumio and Monticello. You can even expect a Michelin star to pop up in the Regino Valley. In expert hands such as these, even the humble pizza becomes something special when cooked au feu de bois (wood fired) and served with a carafe of ice-cold rosé. For a truly traditional and rustic experience, fermes auberges (or farmhouse inns) serve the most authentic Corsican food – 70 percent of which must be home, or at least very locally, produced. Expect a set menu, communal tables and a thoroughly enjoyable time. At nearly 6km long, Calvi beach is easily the longest in The Balagne region – a sweeping bay of silver-white sand separating lush pine forest from crystal clear waters. Access is via La Pinède, the pine forest alongside the N197/T30 as you approach Calvi. There are several parking spots just off the road through the forest. Facilities here are rather good, with lifeguards, watersports and picnic areas in abundance. The water is shallow too, making this an ideal beach for families with little ones. Near the Revellata Peninsula lies a wilder, more rugged beach – a secret cove hidden from others by headlands of dramatic rocks and fragrant maquis to either side. Enjoy the easy 20-minute stroll through the maquis from a little parking area on the D81 towards Porto. A popular little beach hut restaurant serves fresh, simple food. If it’s busy, secluded picnicking spots on the rocks can always be found. This fine shingle beach offers some of the very best views across the Bay of Calvi to the citadel, which looks particularly stunning from here as the sun sets. Leave the N197/T30 in Lumio at the turning by the pharmacy. Follow the road to the end and cross the railway tracks into the parking area. The snorkelling here is fantastic, as is the restaurant, which also hires out sunbeds. Arguably the most beautiful beach in The Balagne region, Ghjunchitu is a 500m sweep of fine white sand backed by fragrant maquis. Parking (about a five-minute walk from the beach) is signposted around 1.5km from L’Île Rousse on the N197/T30 towards Calvi. A lack of facilities here adds to the natural charm, although there is a rather good restaurant overlooking proceedings from one end of the beach. A combination of fine white sand and pebbles, this unspoilt bay is also great for snorkelling and swimming. There’s a snack bar and a lovely backdrop of pine and eucalyptus trees. Bodri is 2km from L’Île Rousse, signposted off the main road from Calvi. Park and walk down the path. More secluded than other beaches in the area, in the off-peak season, you might have the beach to yourself, although it gets busy in July and August. A peaceful alternative to the main town beach in L’Île Rousse. Here, a less urban spot of sunworshipping can be enjoyed, a short stroll from the town centre. Take Savelli Boulevard to the end of Napoléon beach and turn left into the car park. Alternatively, park opposite Place Paoli in L’Île Rousse and walk to the end of the promenade. There are sunbeds and a couple of good restaurants here, as well as an aid station during the peak season. Wending its way through the pretty hilltop villages above L’Île Rousse, the Balagne Craft Road is a journey of discovery, with glassmakers, jewellers, potters, beekeepers and wine producers at every turn. Let your artisanal journey begin at Calenzana or Corbara. Relaxed and unassuming as marinas go, Sant’ Ambroggio is just minutes from the town of Lumio. A restaurant and a café with an attractive outside seating area await, but the real draw is the chance to hire a boat to explore secret coves and deserted bays. The haunting strains of the local male-voice choirs are a core part of Corsican national identity. Catch a few numbers in the magnificent surroundings of Calvi citadel and finish your evening with a walk round the ramparts overlooking the lights of the harbour. Small but perfectly formed, the citadel is said to be the birthplace of Christopher Columbus. Despite being bombarded with cannonballs for 40 days by Admiral Nelson, the town’s rabbit warren of streets is perfectly preserved, providing a delightful wander through history. 3,000 hectares of pine and oak trees offer a wonderfully cool walking trail, made all the more refreshing by a river of mountain meltwater. Several routes are way-marked – or you can simply relax beside a tranquil rock pool. Chugging its way between Calvi and L’Île Rousse, this charming two-car train treats its passengers to one of the world’s most scenic railway routes. And you can hop off at one of many coastal villages for a glass of something cold. Just off the Calvi coast, there are dive sites for all abilities, including the wreck of a B-17 bomber for those PADI-qualified. Head for Calvi or L’Île Rousse ports and remember, don’t dive less than 48 hours before you fly. Pedal the trail up to Notre Dame de la Serra and the Punta Catarajo, which conveniently finishes at Clos Landry vineyard. Or try the 15km round-trip from Calvi to the Revellata Peninsula lighthouse, stopping for a dip en route. Take a gentle plod through the breathtaking countryside to Sant’ Antonino or enjoy the thrill of a sea-splashed canter along a fabulous beach. The scenery in every direction makes this perfect riding country – for beginners and experienced riders alike. Camerone. The Parachute Regiment of the Foreign Legion in Calvi offers a rare glimpse inside its barracks in commemoration of a famous battle. Labour Day. Banks, post offices and other government buildings close – as well as most shops. Fête de la Victoire/Victory in Europe Day. A public holiday. Ascension Day. A public holiday. Pentecôte/Whit Weekend. A public holiday. ‘Calvi on the Rocks’ music festival. Fête de la Voix/Estivoce, Pigna. Celebrated festival showcasing Corsican music and art. Bastille Day, public holiday. Fireworks at Lumio village on 13 July, Calvi on 14 July, L’Île Rousse on 15 July. Assumption Day, public holiday. Huge celebrations including a firework display in Calvi. Foire de L’Île Rousse. Carnival, local musicians, dancing, Corsican crafts and a funfair. Chants Polyphoniques, Calvi. Festival of polyphonic music. The abandoned village of Occi is the perfect place to watch a beautiful Corsican sunset. Perched high above the village of Lumio, the panoramic views over the bay of Calvi are simply breathtaking, and the experience is made all the more romantic when you’re sitting among ancient ruins. Arrive in plenty of time – maybe with a bottle of something nice to drink! The Asco Valley is full of beautiful rock pools, but our absolute favourite is just past the little auberge in Asco village called E-Cime. Here, a left turn down an unmade road brings you to an old Genoese bridge, under which hides an enchanting natural swimming pool. A picnic of bread and salami after a leisurely swim makes for a perfectly relaxing afternoon. One of the most powerful healing oils in the world is wild-harvested right here in the Corsican countryside. Immortelle Essential Oil is extremely scarce and has historically been used to fight infection, soothe aches and pains and even treat respiratory problems. Visit the little-known distillery in Lumio and discover the oil favoured by cosmetic companies who claim it reduces fine lines. For a perfect place to truly unwind, head for the parking area at Arinella beach, cross the railway track and turn immediately right. At the end of the road, a five-minute walk through the maquis brings you to the idyllically small and secret Algaio beach, which you might even have all to yourself. It’s particularly delightful in high season when other beaches can get busy. A visit to the little village of Morosaglia, close to Ponte Leccia in the Castagniccia region, uncovers a museum dedicated to Pasquale Paoli. The boy who would go on to become the Corsican freedom fighter known as ‘the father of the nation’ was born here in 1725 and died in exile in Britain after the island was reoccupied by France.